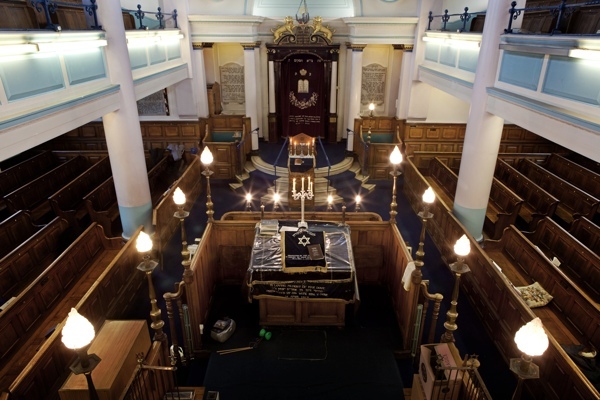 When Leon Silver opened the golden shutter of the ark at the East London Central Synagogue in Nelson St for me, a stash of Torah scrolls were revealed shrouded in ancient velvet with embroidered texts in silver thread gleaming through the gloom, caught by last rays of afternoon sunlight. Leon told me that no-one any longer knows the origin of all these scrolls, which were acquired as synagogues closed or amalgamated with the departure of Jewish people from the East End since World War II. Many scrolls were brought over in the nineteenth century from all across Eastern Europe, and some are of the eighteenth century or earlier, originating from communities that no longer exist and places that vanished from the map generations ago. Yet the scrolls are safe in Nelson St under the remarkable stewardship of Leon Silver, President, Senior Warden & Treasurer, who has selflessly devoted himself to keeping this beautiful synagogue open for the small yet devoted congregation – mostly in their eighties and nineties – for whom it fulfils a vital function. An earlier world still glimmers here in this beautiful synagogue that may not have seen a coat of new paint in a while, but is well tended by Leon and kept perfectly clean with freshly hoovered carpet and polished wood by a diligent cleaner of ninety years old. As the sunlight faded, Leon and I sat at the long table at the back of the lofty synagogue where refreshments are enjoyed after the service, and Leon’s cool grey eyes sparkled as he spoke of this synagogue that means so much to him, and of its place in the lives of his congregation. “I grew up in the East End, in Albert Gardens, half a mile from here. I first came to the synagogue as a little boy of four years old and I’ve been coming here all my life. Three generations of my family have been involved here, my maternal grandfather was the vice-president and my late uncle’s mother’s brother was the last president, he was still taking sacrament at ninety-five. My father used to come here to every service in the days when it was twice daily. And when I was twenty-nine, I came here to recite the mourner’s prayer after my father died. I remember when it was so crowded on the Sabbath, we had to put benches in front of the bimmah to accommodate everyone, now it is a much smaller congregation but we always get the ten you need to hold a service. I’m a professional actor, so it gives me plenty of free time. I was asked to be the Honorary Treasurer and told that it entailed no responsibility – which was entirely untrue – and I’ve done it ever since. As people have died or moved away, I have taken on more responsibility. It means a lot to me. There was talk of closing us down or moving to smaller premises, but I’ve fought battles and we are still here. I spend quite a lot of hours at the end of the week. We have refreshments after the service, cake, crisps and whisky. I do the shopping and put out the drinks. The majority here are quite elderly and they are very friendly, everyone gets on well, especially when they have had a few drinks. In the main, they are East Enders. We don’t ask how they come because strictly speaking you shouldn’t ride the bus on the Sabbath. Now, even if young Jewish people wanted to come to return to the East End there are no facilities for them. No kosher butcher or baker, just the kosher counter at Sainsburys. My father’s family came here at the end of the nineteenth century, and my maternal grandfather Lewis (who I’m named after) came at the outbreak of the First World War. As a resident alien, he had to report to Leman St Police Station every day. He came from part of the Austro-Hungarian Empire and he came on an Austrian passport, but when my mother came in 1920, she came on a Polish passport. Then in 1940, my grandfather and his brothers were arrested and my grandmother was put in Holloway Prison, before they were all interned on the Isle of Man. Then my uncle joined the British army and was told on his way to the camp that his parents had been released. My grandparents’ families on both sides died in the Holocaust. My mother once tried to write a list of all the names but she gave up after fifty because it was too upsetting. And this story is true for most of the congregation at the synagogue. One man of ninety from Alsace, he won’t talk about it. A lot of them won’t talk about it. These people carry a lot of history and that’s why it’s important for them to come together. Thanks to Leon, I understood the imperative for this shul to exist as a sacred meeting place for these first generation immigrants – now in their senior years – who share a common need to be among others with comparable experiences. 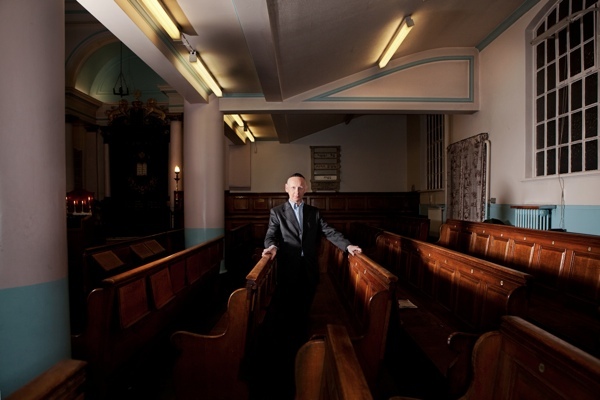 Polite and softly spoken yet resolute in his purpose, Leon Silver is custodian of a synagogue that is a secure home for ancient scrolls and a safe harbour for those whose lives are shaped by their shared histories. It was humbling and a privilege to be able to glimpse some of this remarkable history. I am so glad I found out about Spitalfields Life as a result of a brief, chance meeting with a fellow family history researcher. Thank you. Thanks for this wonderful description. My grandparents were married in New Rd Synagogue and moved to the greener pastures of South Hackney about 1926. I shall be coming to Leman St next week to photograph the house where our family lived in the 1920s. If Leon should read this note I would feel honoured to meet him. don’t ask how they come, god bless. I have been going occasionally to this shul over the past few years, always welocming and pleased to see you. Leon is a rare character, works tirelessly in running the shul. I recoomend a visit. What a beautiful place,and what a devoted and wonderful man Leon is.If only I were in London……..
My late parents were married at Nelson Street Synagogue December 1945. 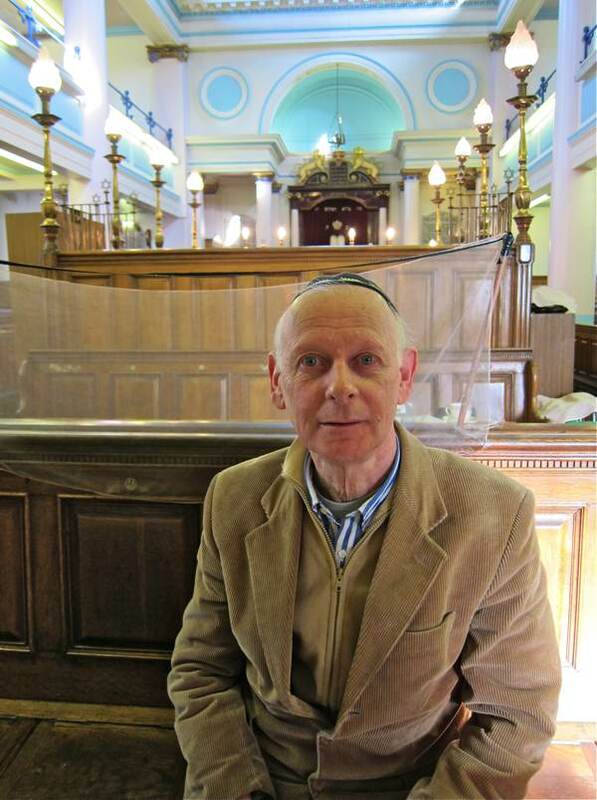 I visited Nelson Street on open house London Sept 2013 You gave a great a talk and explained the religion lovely which made it easy to understand having a Jewish partner with family connections in the east end I really enjoyed it. So the Sunday after we came back with more of his family for the 90th birthday service. We was made very welcome and really enjoyed it. Thank you again. I attend Nelson St and it is the source of all for me. The one mainstay that exists when I am hurt..or need to gain extra Jewish footing..
My parents were married here and all my brothers and I were married here. please come and support this Shool and stop the place from ever closing. Leon Silver is the very embodiment of Jewish history in the making. I’m proud to know a person who has devoted himself so deeply to a wonderful cause. The history of the Shool and the celebrations of life there defy description . I send best wishes to all and I am very proud to have grown up in Whitechapel . My parents got married there . My brothers and I got bar mitzvah there . Come there and help make up a minyan. I recently obtained a copy of the civil marriage document for my parents who were married on November 26, 1937 at the “East London Synagogue,” according to this document. 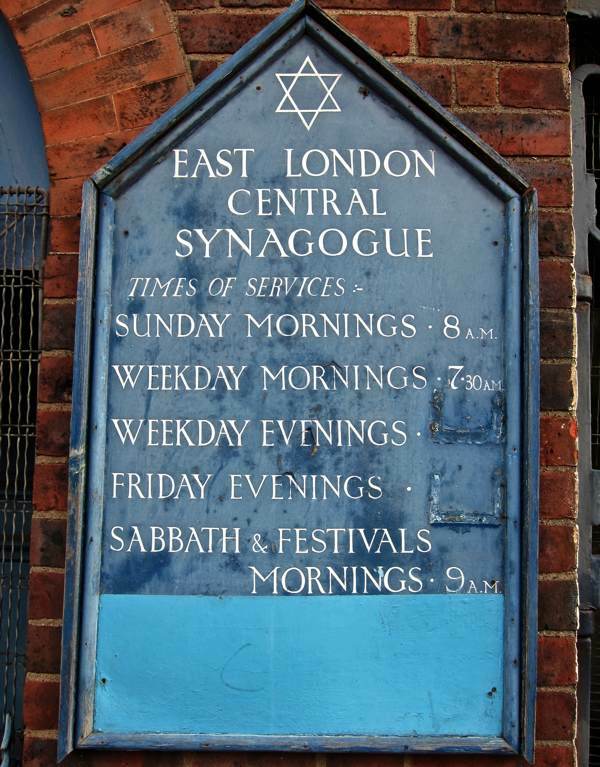 Please can you confirm – or otherwise – that your shul in Nelson Street is one and the same, having been known as the East London CENTRAL synagogue ? The record of their marriage is in the civil records of the borough of Stepney of that era. Just a few weeks ago, before i obtained the document, we stayed with dear friends in Wilkes Street. I could have visited the synagogue at that time. I was made aware of you and the shul through the episode of “Yidlife on London” which I throughly enjoyed.